A flower from the special class with Shri Mahayogi before he returned to Japan. 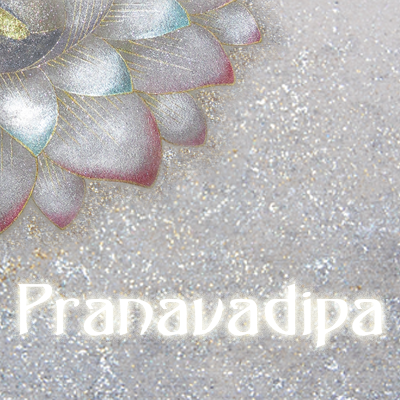 PRANAVADIPA Issue #8 is published today! These are the words written by Ms. Shibasaki, now called Yukti, in the article she wrote that is posted on the Mahayogi Yoga Mission’s website, ”Searching for God’s Love”. 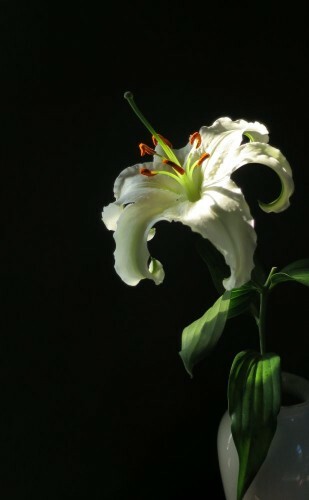 Written in 2012, our sister shares with us the story of her search for the answer to a burning question, how best to serve the dying, and the answer, which, after much searching, arrived through the words of Mother Theresa: “Be holy.” One can feel Yukti’s determination and dedication to really find the way to practice this, to practice “being holy.” And, although she wrote this article fairly recently, this conviction and willingness to practice seems to be something that has been evident in her practice for many years. The Satsangha published in this month’s issue of PRANAVADIPA just so happens to center primarily around conversations between Yukti and Shri Mahayogi that took place in Kyoto, Japan in 1998, about fourteen years before the aforementioned article was written. At that time Yukti had only been practicing with the Mission for one year, but within this one year she had experienced a significant transformation and had completely healed from a condition that almost took her life, simply by diligently and seriously practicing Yoga in precisely the way that Shri Mahayogi guided her. In reading through her questions, which are so direct and honest to her situation, in reading Shri Mahayogi’s responses, in which he is so gracious and generous in providing detail, and in reflecting on Yukti’s more recent experience, it is so interesting and fascinating to see how Shri Mahayogi has guided her seamlessly along a path that seems to be so appropriate for her particular propensities. In this Satsangha, Shri Mahayogi speaks about how both the Buddha and the Christ taught according to the needs of each individual and their situation. He intertwines various teachings of the Christ and expounds upon the essence of their meaning with precision and purity. He even mentions the importance of being in Holy company, which, from a slightly different angle, is redelivered to Yukti so many years later. It is hard to say whether anyone could have foreseen the path that Yukti would follow so many years after this Satsangha took place, going on to understand various aspects of Yoga through the lens of Christian teachings, and even writing a series of articles about Mother Theresa and another series about Teresa of Lisieux. Nonetheless, from this Satsangha, it seems that since the beginning, Shri Mahayogi guided her in this direction and by taking in his teachings with faith and the seriousness to apply them in practice she allowed herself to be guided. The interactions (questions and answers) between Shri Mahayogi and Yukti reveal how the Master guides the soul ever closer to the realization of Truth. The Master continuously reflects the level of willingness and seriousness to practice and yearning for Truth that is present in the disciple. There is beauty in their interactions, as they arise out of the trusting and respectful relationship between Master and disciple that is Love.